tr ps around each of 3 skipped sts. And that is a huge problem when asked to crochet cables in this. Watch every online tutorial for mastering crochet cables? ...or how 'bout trying a knitted cable? Finding Redheart's pattern for a knitted cabled throw & throwing caution to the wind, I started to knit cables. Wow. Just let me say, comparatively speaking: a knitted cable is much, much, MUCH easier to do than a crocheted cable. And for someone who has struggled with knitting (me) I am amazed at how easily this is just flowing off of my needles. This is a before & after photo of my yarn. I am ashamed to admit that I stashed my yarn in a rubber tub. A huge 'no-no', I know. Completely inexcusable, I admit. But then I started seeing paper towel tubes used as nostepinnes for achieving centered pulled skeins of yarn. (btw -- I could do a whole post on the simplicity & beauty of these wooden treasures, but a paper towel tube was much easier to come by. But rest assured -- I have dropped subtle hints to kids & husband that I would love to have one/more of these handcrafted lovelies in my possession.) I then proceeded to take every messy skein in my rubber tub & carefully wrap each one into a centered pulled skein of yarn. A centered pulled skein of yarn is neat, orderly & so lovely to look at! Dawn, your knitting is stunning! Those cables really pop....good job! I have never used a nostpene...I've always used a ballwinder for center pull balls. I like the idea of using the paper towel core because that can be found almost anywhere - even when I'm on vacation and need to wind some yarn. Once again, Dawn...your knitting is really beautiful. Job well done. I have not knitted cables for many years but I do not remember them being too hard back then. I hope that you don't frog it, as much as I love your knitted cables! I think that all the directions mean is this: you skip three stitches, then do three treble stitches around the post of those stitches and the go back to the three missed stitches and then do a treble stitch around the posts, holding the cable forward... does that help at all? You blue cables are looking lovely, I'm sure it's going to be a gorgeous throw! I disagree about cables, but I find knitting sooooo difficult. Once you crack post stitches you can crochet cables no problemo!! I love confessions, especially when they are as cute as yours. Those cables looking good! Just don't frog! Dawn!! This is ... I have no words. Amazing, you just started and it look soooooo fine!!! It all looks so wonderful, both the colour and the pattern! I used to knit, now I crochet and I think crochet is a lot mor fun for some reason!?! Although... crocheted cross cables I've never ever tried before. But your work looks so good I have to give it a go! Thank you so much for inspiring - again!! there you go again, Miss Debbie full of doubt...all that means is that you work into the second group of stitches first and then go back and work the first lot...the stitches have to "cross" over each other...OR they're just another bunch o'stitches hangin' out together...but, if it got you knitting again...well... that was the whole plan you know...to get you knitting again...and what a wonderful job you are doing...it's gorgeous girl!!!! Look at those beautiful blue cables. Love them! I like that pattern alot. I may have to copy you. Love seeing you on the dark side (knitting). I know what you mean about crochet patterns, it's like you read it and then read it again and WHAT! Total gobbledegook. Knitting cables are much more straightforward I can do them and I'm rubbish at knitting! Your knitting is beautiful. I dream of being able to knit cables but I am only a basic knitter. I have crocheted all my life but have not tried cables - need to put that on my list. I must confess I store my yarn in a plastic container - I hate to sound stupid but how do you wind the yarn on the cardboard tube. If I don't ask, I will never know! It looks so neat and I am always fighting with my yarn and the tangles that always follow! Curiosity got me and just found a good article on rolling a yarn ball with a cardboard tube. Where have I been that I have never seen this before????? Now I have to give it a try. Your cables look lovely. I too, think crocheted cables aren't worth the acrobatics it takes to achieve them. 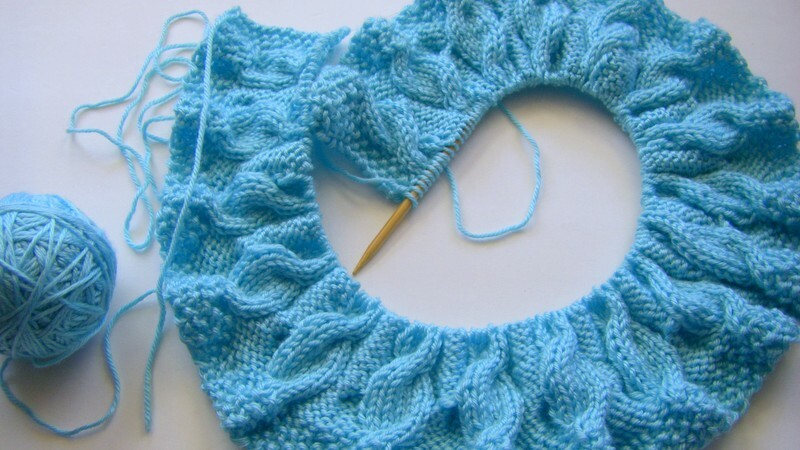 Knitted cables look complicated, but wow, fun AND easy to accomplish. Hello my friend and follow you like a very nice blog, I would like to weave into the hands of health Tantine you please add me to your friends list will be very happy to discuss my blog loves. Hey there! wow for someone who has trouble with knitting, those are some pretty awesome cables! and what a good idea with the paper towel tubes! I'm a new follower, I'm also a crocheter and I love looking at all your patterns. I might even try some! I have a ball-winder, never thought to use a paper towel tube, great idea!